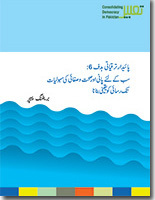 This is Urdu version of “Sustainable Development Goal 6: Ensure Access to Water and Sanitation for All”. The Briefing Papers on Sustainable Development Goal 6: Clean Water and Sanitation has been prepared to provide background information to political party officials on Pakistan’s international commitments under Sustainable Development Goals (SDGs) and the progress in achieving the goal in Pakistan. Pakistan has adopted SDGs as Pakistan’s National Development Goals. These goals are being aligned with the national, provincial and local planning and financing frameworks. Political parties have a key role to play in overseeing and monitoring of the SDGs implementation at various levels and it is important that they involve with and oversee State’s planning and implementation of SDGs agenda. This Briefing Paper has been authored by Ms. Aasiya Riaz, Joint Director, PILDAT.